Porsche is launching its new Boxster in May which gets an all-new lightweight body, new flat-six engines with direct petrol injection and a completely revised chassis. 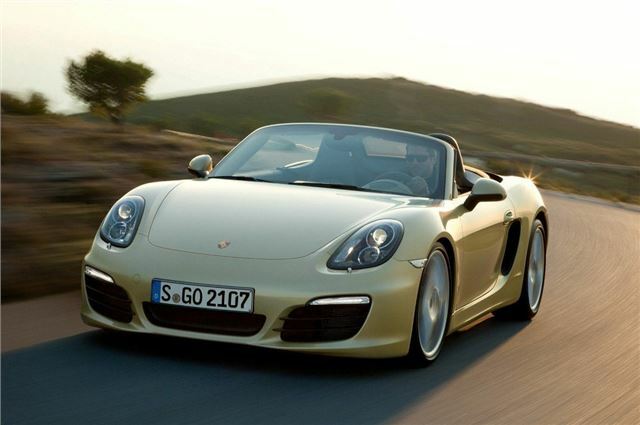 It's priced at £37,589 for the Boxster while the more powerful Boxster S costs £45,384. While the overall shape hasn't changed too much, there are some key styling changes that make this new Boxster easy to distinguise from the outgoing version. It has new headlights and rear lights, shorter overhangs, a flatter profile plus the windscreen has been shifted forward. Inside there's a new fully electric roof which no longer needs a compartment lid when it is retracted plus the interior is more spacious and includes a new distinctive centre console. The standard Boxster gets a new 2.7-litre engine with 265PS - an increase of 10PS compared to the 2.9-litre engine in the current model. It is based on the same 3.4-litre engine that's fitted in the Boxster S which now develops 315PS compared to 310PS previously. Both models have a six-speed gearbox as standard with the PDK seven-speed automatic available as an option. The dual-clutch PDK gearbox also helps improve economy with the Boxster averaging 36.7mpg and the Boxster S returning a claimed 35.3mpg - impressive figures considering the performance on offer. Acceleration from 0-62mph takes just 5.7 seconds in the Boxster and an even quicker 5.0 seconds for the Boxster S.
The car itself is now considerably lighter than before plus it has a wider track and larger wheels as standard. This aids handling and also helps to improve fuel economy with improvements of up to 15 percent in efficiency. The Sport Chrono Package option is available, featuring Dynamic Transmission Mounts for the first time. Also new in the Boxster is the option of Porsche Torque Vectoring (PTV) with a mechanical rear limited slip differential. The Boxster comes with 18-inch alloy wheels, automatic stop/start, Sports mode, remote control roof, a seven-inch colour touchscreen control, a universal audio interface with MP3 connectivity plus a three year warranty. The Boxster S adds 19-inch alloy wheels, partial leather interior and xenon headlights. All new Boxster customers can also explore the potential of their car by participating in a complimentary course at the Porsche Experience Centre at Silverstone.